Food photography is creative, artistic and technical. Get food photography tips and learn how to take beautiful photographs full of lovely, rich colour. It is surprisingly difficult to make delicious food look delicious in photographs. Despite my best efforts, my photographs looked badly lit, flat, unappetising, colourless and shapeless. Sad times. So I did my research, learnt my way around the latest software, collected props (love that bit!) and discovered how to manipulate light and colour. I completely transformed my photography into the bright, bold style you see before you. It suits me. If you’re struggling with your photography and things aren’t looking quite right – not quite as dreamy and Food-Gawkery as you hoped – then give some of these resources a go. Discover your signature style! It took me a long time to subscribe to Adobe’s Creative Cloud – I have used free resources (nefariously and non-nefariously) for all my digital life. But with Adobe remarketing its photography software on a reasonably priced subscription basis, my time had come. Coupled with a little Skillshare training in Lightroom and Photoshop (more on this below), I am now a half-competent digital editor. And you can be too! The entire Creative Cloud suite is a little too much for my needs, but their photographer package (Lightroom and Photoshop) is great – the highest standards of photo organisation and editing for the most professional digital work. With the WP/LR Sync plugin you can also connect your WordPress website to Lightroom and publish directly from your photo editor. Create SEO-friendly titles, ALT text and filenames in Lightroom and see those labels applied in your WordPress media library. Make edits to image size, appearance and labelling, then sync those changes with your website. A fantastic system for those who like things streamlined and well organised. A few hours editing photographs in Lightroom will be murder on your fingers – all those pressured micro adjustments put your finger joints and tendons under immense stress. An editing pen (graphics tablet) can really help with that. The pressure is transferred away from your joints and to the end of the pen, while editing is easier, more natural and more intuitive. If you edit a lot of photos, you need a graphics tablet. As well as editing photos, you can sketch, paint and design with an editing pen/graphics tablet, with the pen mirroring the pressure of your brush strokes. This particular editing pen/graphics tablet also doubles as a touch pad (they don’t all have this function), so you can use it for all your mouse needs as well. It can be used wirelessly with a wireless kit (purchased separately) – much more pleasing for those of use who like a clean, sleek desk – but the kit is quite a bit more expensive. One of my very favourite things about the internet (and I’m old enough to remember life both before and after it) is the educational possibilities. If you are so inclined, you can learn how to do pretty much anything. There are videos, tutorials, step-by-step directions with images, audio – learning in all kinds of ways, from all kinds of teachers. It is brilliant! Of course, there are plenty of free, high quality resources available – I myself try hard to produce content that people can learn from. But for me there is a qualitative difference between the resources scattered around the internet and the more professional training resources that are available on sites like Skillshare and Lynda. If cost is a factor, Skillshare is the more affordable option and first three months are essentially free. 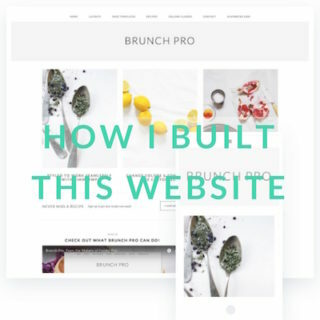 Brand your Creative Business by Faye Brown was great when I was relaunching my website. There are four courses: Define your Brand; Launching your Brand; Designing your Logo; and Social Media that take you through the various branding stages. Also, Pinterest Marketing for Creative Entreprenuers by Pinterest guru Peg Fitzpatrick. These fantastic food photography courses by professional food photographer Leela Cyd – Prepping a Photo Shoot, Creating your Unique Story and Shooting in Five Styles – radically changed my approach to planning, styling and photographing food. Very much for the better! The lifestyle photography classes Visual Storytelling and Photography for Inspirational Storytelling by professional food/lifestyle photographer Marte Marie Forsberg. For learning how to master Lightroom, Fundamentals of Lightroom I: Organize Files and Boost Your Workflow and Fundamentals of Lightroom II: Editing and Post Processing by Lotus Carroll were extremely useful and easy to follow. This book revolutionised my food photography. Plate to Pixel takes you through every aspect of food photography with a heavy focus on manipulating natural light. This was the big change for me – learning how to use light correctly to show off the luscious textures and colours of food. Helene Dujardin took me by the hand and led me through all the possibilities and how to bring them under my control. She also addresses styling and props – where to get them and how to use them. Composition and colour. What to do when the natural light really and truly has run out. And how to process, edit and organise your photographs after capture. Plate to Pixel completely and utterly transformed my photography and it is now one of the aspects of blogging that I love the most dearly. I cannot recommend a better place to start. I hear in the food blogging world that it’s either Nikon or Canon, but my Pentax DSLR has been serving me well since 2007. No doubt there are more up-to-date offerings available now, but treated right this camera still takes beautiful, clear, colour-rich images in huge, high quality resolutions. To replace it would be a shameful waste. I bought a couple of zoom lenses together with the body and they served me very well for years, but recently I discovered the world of vintage lenses. A world of beautifully made photography equipment crafted in Japan – the home of attention to detail – in the 1970s and 80s. And available at very low prices on Ebay. My 50mm f/1.7 lens breathed new life into my camera and food photography. Those gorgeous, dreamy, blurry backgrounds of modern food photography were now within my reach. For a fraction of the price of a modern equivalent. Something to consider if you’re struggling to find the money for the expensive equipment that today’s photography demands. As my camera is older, I also use a plugin so I can tether my Pentax K20D. I was unable to do this for years, but some enterprising software designer finally fixed it. I was literally overjoyed when I discovered this plugin. Now I can see images on my massive (also secondhand) iMac as soon as they are shot (10 seconds from click to screen). I cannot tell you how much easier it is to get photographs right when you can check them on a big screen. Any error in focus, brightness, aperture and styling leaps out at you begging to be adjusted. It’s almost cheating. You’ll need a long tethering cable – make sure you get the right type of plug/pin for your camera. Other essential equipment includes a few fast memory cards and spare batteries. I sometimes work as a freelance journalist, typically supplying editorial photography to go with my articles. This means there are times when I only have one chance to get a shot and I might not be able to get out my tripod, reflectors and lights. For that kind of photography I turn to my Fujifilm X100T – another secondhand buy. This camera is Fujifilm’s modern reworking of the Japanese cameras of the film era – carefully made, beautiful design, pleasingly functional. It is fantastic in low light – ISO technology has come a long way since my Pentax DSLR was made – so I know it will get that shot when I need it. I shoot DNG (this camera can be used fully manual) and the pictures that result are very high resolution with rich, bright colours. It is extremely compact and light – small enough to tuck into even my most modest of handbags. There is really no excuse not to take it everywhere you go. One of the best features of this camera – and one that makes it great for food photography as well – is the possibilities for depth of field. The camera has both low f-stops (f1.7) and very fast shutter speeds, so even in very bright sunshine you can take shots with dreamy, blurry backgrounds that isolate your subject and just make everything look better. As I mentioned, those super high ISOs make it equally great in low light – situations that are often a problem for my DSLR. At the flick of a switch, you can see the effects of your camera settings – very useful for making live adjustments. There are countless other technical features, but these are the most important for me. This camera has become a modern photography icon, with all kinds of photographers swapping their heavy DSLRs for this light-as-a-feather offering. I like having both. This camera is not cheap, even secondhand, but the earlier models X100 and X100S (that are also highly recommended) can be bought much more reasonably on Ebay. While you cannot tether this camera in the same way as a DSLR, you can send image previews to an iPad so you can see them on a bigger screen as you shoot. I live in Leeds in the north of England. It is a liberated, jolly, friendly city with plenty of good food and cocktail happy hours (I am a woman of simple needs), but the weather isn’t brilliant. It’s not all doom and gloom – there are days and days of brilliant, life-affirming sunshine where I run for the nearest dale and commune with nature while it’s playing nice. But there certainly is gloom. And darkness. And rain. I used to only shoot in natural light, but in Leeds this often means moody, dreary photos that no amount of editing can fix. Perhaps for photographers who like that dark, atmospheric style it would not be such a problem, but I want bright, clear whites and happy, bold colours in my photography. They were not forthcoming. My website is very white, with the focus strongly on the food, so it is really important to me that the whites in my photographs look white. This pursuit drove me crazy for years. When I spent a long time shooting a dish or cooking process, the light would change across the day and no amount of editing could make the colour in those images look quite the same – see this post for a maddening example! Until I discovered these wonderful Lowel Pro Ego lights. These lights give out pure, white, daylight-style light. It is very easy for your camera to colour balance this light and it renders whites white and colours strikingly bright. Finally! Colour and tone is always consistent with these lights, so if you want a harmonious look for your website or book, these are the lights for you. You can also use these lights in the lowest possible light – pitch black even. In fact the less light there is from other sources, the cleaner and whiter the light from the Lowel Ego Pro. I now shoot exclusively with these lights – I started with one light, then graduated to two so I could take lovely wide overhead shots. To my eye, my photographs look dramatically better now. Gorgeous, deep colours. And lovely white whites that bleed into my web background in an extremely pleasing way. Food Blogger Pro have a video course on how to use these lights, but it’s pretty easy. Turn them on, use a white reflector or two to bounce the light back onto any shadows and snap away. I use simple white board to manipulate this light (the Lowel Pro Ego light also comes with a small reflector – pictured). For the very cleanest results, I arrange the lights to provide back and side light, then create a frame of white reflectors round the rest of the shot. This leaves no patches of deep shadow, but you can play with this as you fancy. Essential equipment for those in northern climes. The best place to get Lowel Ego Pro lights in the UK is Prokit – and it’s important that you buy lights with the correct voltage, even though they’re considerably cheaper in the US. The bulbs on US lights will blow when used at 240v in the UK. For US buyers, Adorama is a good choice. This Mantona tripod is a great compromise if you’re looking for something more professional, but can’t stretch to a high-end tripod, such as Manfrotto. It has ball head attachment for the camera, which means it can be angled in every direction and a quick-release plate you can leave on your camera. It is extremely sturdy with strong clips and these fasteners can also be adjusted to your own tight/smooth preferences. The legs extend quickly and easily, and they can be set securely at any height, with rubber feet help keep it secure. The centre column (which holds the camera) can also be turned completely upside down if you want to take floor-level macro images. Lastly, this tripod is also compact when packed (50cm) – small enough to fit in a small airplane-friendly suitcase – a necessity for comfortable travel with my photography gear. I take lots of overhead shots in my food photography and in the past this has involved me balancing precariously on a plant holder (no chairs! ), often with one foot on the table, trying not to get my shoe in the shot. Entertaining mental image? My tripod with camera attached has also crashed to the floor when I’ve removed my grip to style the food – very distressing! So, save your camera, your back, your plant holders and your sanity and get yourself an overhead arm to attach to your tripod. That was one of the reasons I ended up opting for a Mantona tripod – the reasonably priced overhead arm that could be bought to go with it. As far as I can tell this tripod and tripod arm are only available in the UK, but this option looks similar for shoppers in the US. Excellent article! I personally like the white background it really brings out the vibrant colors of the food!